St. Louis Mayor Francis Slay met Thursday with youth activist leaders to address a set of demands presented to him on Monday, when protesters stormed City Hall. Protesters file through metal detectors at City Hall in St. Louis, during a day of demonstrations for the Ferguson October weekend. The demands include a civilian review board for police and independent reviews for officer shootings resulting in fatalities. Protesters also want all city police to be equipped with body cameras, and for police to give up any military equipment acquired through the Pentagon's 1033 program. Jeff Rainford, Mayor Slay’s chief of staff, said on Monday that the city of St. Louis was already working on some of the issues addressed in the demands. Last month St. Louis public safety director Richard Gray announced that the department is looking into the cost of purchasing body cameras for officers to wear. However, where funding would come from and a protocol for sorting information has not been determined. Rainford says a civilian review board is also in the works. “The mayor has directed the public safety director to negotiate civilian review board with a combination of parties,” he said. But he notes that establishing a review board is not something that should or could be done quickly, and that everyone in the city should have the chance to provide their input. Rainford also notes that St. Louis does not have a relationship with the 1033 program, which provides surplus military equipment from the U.S. Department of Defense to state and local law enforcement agencies for use in counter-narcotics and counter-terrorism operations, and to enhance officer safety. Mayor Slay met with a few of the protest leaders on Thursday evening, including Rasheen Aldridge of the group Youth Activist United. Although officials say some of the requested changes are being addressed, Aldridge says change is not happening fast enough. Aldridge said the conversation was “baloney” and there was no talk of future meetings. On Friday, Maggie Crane, communications director for Slay, said the changes protesters want to see will take time. "We all want things to happen faster, but there is a reason that thinga happen the way that they do. This is what democracy looks like, " she said. Even though activists and city officials have differing timelines, Crane says they both want the same things. "I think at the end of the day, we are really on the same page in the same direction," she said. "Both want transparency, a better relationship with the community and something that is fair to the community and police officers." After the meeting, the reporter from St. Louis Public Radio was denied entry to City Hall to speak with a representatives from Slay’s office about the gathering. 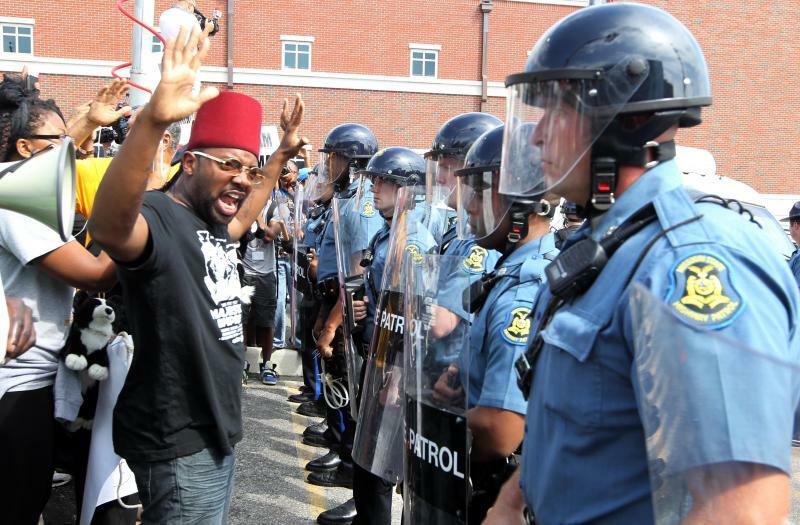 What Will It Take To End The Violence In Ferguson? Most people want the nightly violence in the streets of Ferguson to end. But getting there could take a while. The protestors who have been gathering daily in Ferguson since the shooting death of Michael Brown on Aug. 9 say they just want justice done. For many, that means seeing police officer Darren Wilson arrested and imprisoned. But Washington University public health professor Darrell Hudson said short of that, providing more information about the investigations would help.